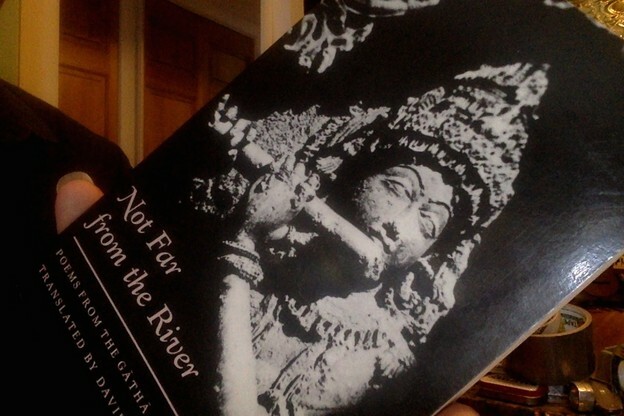 Bibliography: Not Far from the River: Poems from the Gāthā Saptaśati, translated by David Ray (Copper Canyon Press, 1990). ¶ Ray’s numbering for the items in his selection is simply sequential (1–356); it does not correspond with the numbering in Indian editions of the Gāthāsaptaśatī of Sātavāhana Hāla. However, I own a reprint of the Asiatic Society of Kolkata edition, which was Ray’s principal source-text. I’ll install a few items from this, for comparison’s sake, in an appendix. The Gāthāsaptaśatī is supposedly the oldest extant anthology of secular poetry from South Asia, and is reputed to have been compiled by King Hāla in the 2nd century CE. The language is Mahārāṣṭri Prākṛt, the ancestor of modern Marathi. King Hāla has chosen a mere seven hundred. he preferred those that caught life in their nets. remain open, like blue of the lotus. Then her pleasure gets ugly, too busy, intent. like the hair on a crab or a cucumber. with your too perfect face, round as the moon. kissing her feet. I climbed on his back. She broke into laughter, dragged him away. Years later, I figure it out. and seeing him involved with another. because he throws me not one glance of contempt. are thin from wanting him. and thin like a worm on a Nimba leaf. She’s charming, youthful and ripe. There’s no moon. Yet she won’t let me. He’s gone on a trip, leaving his harem. bathe together at dawn in the river. wrestling with love till it dies on them. also from the gossip of vile men. Or from no cause at all. of those whom you truly adore. who truly deserve our pity. when it comes to matters of love. then the madness of love gets its way. and my big toe played with his hair. whose kind words are passed on to their sons. true lovers would die if they parted. like defective lamps with foul smoke. the others mere gossips and observers. but not how to end it, wait for another. Let the love of harlots be sanctified. both the deep thirst and the hunger. no one to tell all my thoughts. in this wretched village of low people? in sly circles, smile before you do. most of all she’ll have to do the work of it. then makes love to herself in the shade. wherever you look—her arm, leg, belly. as soon as you get close enough. pale skull waits beneath her skin. as if to examine his foolishness. at least in this life. from the past life, hope from the next. and my toes can uncurl. In town he studied seduction. Now he lures us one by one to his hut. leave us aglow like unplanned encounters. with no concern for the poor and distressed. But the best rescue others. are beautiful on one side only. Quarrels leave debris in the mind. rotten straw, along with foul secrets. But all get consumed on the fire. after they’ve trapped what they wanted. should avoid the banks of the river. for blossoms crushed on a lovebed. as if he’ll never enjoy such a sport himself. if a beautiful woman kisses it. who have never laid eyes on this man. and not speak in faltering words. your fury when he’s back with me. And yet we are sisters, or should be. of Eros well, let it burn hot as hell. consumed like paper with the first flame. her hair’s a splendid curtain, swaying. Her earrings dangle, her necklace shakes. And she’s busy, a bee on a lotus-stalk. make love with all manner of girls. learn the difference between good, better, best. because unselfish love wells up in his heart. she pulled him on top of her once more. they won’t calm down, regard us as friends. old men once sipped at the poison of lust. Take that damned parrot away. has them gathered around him. It’s not the best river, perhaps. But for love under water, ours is best. to describe what he’s seen through the reeds. he’d speak of her sweetly—same woman, same tricks. possessed of subtle, unbearable knowledge. we had held our tongues, speaking of love? Appendix A: Specimens from The Prākrit Gāthā Saptaśati, Compiled by Sātavāhana King Hāla, edited with Introduction and Translation in English by Radhagovinda Basak (The Asiatic Society, Kolkata, 1971; reprinted 2010), keyed to Ray’s numbering, above. Out of one koṭi (ten millions) of gāthās (verses) adorned with alaṅkāras (ornaments or rhetorical figures of speech) seven hundred (only) have been collected (or compiled) by Kavivatsala (literally one who is compassionate towards the poets), Hāla. The amorous sports of women at the time of dalliance appear beautiful only so long as their eyes, resembling the petals of blue lotuses, do not become closed (in pleasure). O friend! Such is the way of this love which is as crooked (and fragile) as the hair growing on an infant crab (or, on the Karkaṭikā fruit, a species of cucumber). Do not (therefore) weep with your moon-like face turned round obliquely. When the (little) son climbed on the back of his father fallen at the feet (of his offended mother), a smile appeared even (on the face) of the householder’s wife, though feeling so poignantly afflicted by anger. Separation from the beloved and sight of the disliked person are both sources of heavy sorrows. But salutation be to (your) sense of high birth, (goaded) by which you act (towards myself). Oh son of the village-headman, so cruel, so afraid of your wife’s (mood), so hard to meet with, so resembling a worm in a Nimba plant! the whole village (i.e. the whole body of village girls) is yet getting emaciated on your account. Even the character of a woman, whose residence is on the junction of four roads and who is charming to look at, who is youthful and whose husband is abroad, and whose neighbors are unchaste women and who is herself indigent—is not (sometimes) dissolute. Only this day (our husband) has left home (for going abroad) and (it is found) that wakefulness of some persons (i.e. my co-wives) has evidently commenced this day, and the banks of the Godāvarī also have since this day become tinged with turmeric colour (of their toilet). I think that unfulfilled actions, with those (men) who understand the heart, produce as much happiness as fulfilled actions, with those of opposite nature, can not do [sic]. Love disappears because of the absence of the sight (of the beloved), it also does so by frequent sights (of him), even it does so (again) by the gossip of vile men and (sometimes) it vanishes by itself (i.e. without a cause). Appendix B: Two other translations of this material, both worth mentioning: (1) The Absent Traveller: Prākrit Love Poetry from the Gāthāsaptaśatī of Sātavāhana Hāla, selected and translated by Arvind Krishna Mehrotra (Penguin Books India, 2008)—contains versions of 207 gāthās, and (2) Poems on Life and Love in Ancient India: Hāla’s Sattasaī, translated and introduced by Peter Khoroche and Herman Tieken (SUNY, 2009)—contains the whole kit, divided up by theme.